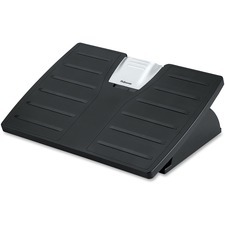 The Fellowes® Ultimate Foot Support features a free-floating platform that encourages lower leg movement to help reduce fatigue. Three platform height settings (4”, 5 1/4” and 6 1/2”) and up to 25° tilt. Surface massage bumps help relieve work-related stress. Elevates feet and legs to help relieve lower back pressure and improve posture. Width: 17 3/4"; Height: 4" to 6 1/2"; Depth: 13 1/4"; Color(s): Black/Gray.